Grow your own Sauerkraut Garden. Oh that fragrance – it just makes you pause and breath it in more deeply. Summer. It reminds me of Summer. The warmth. 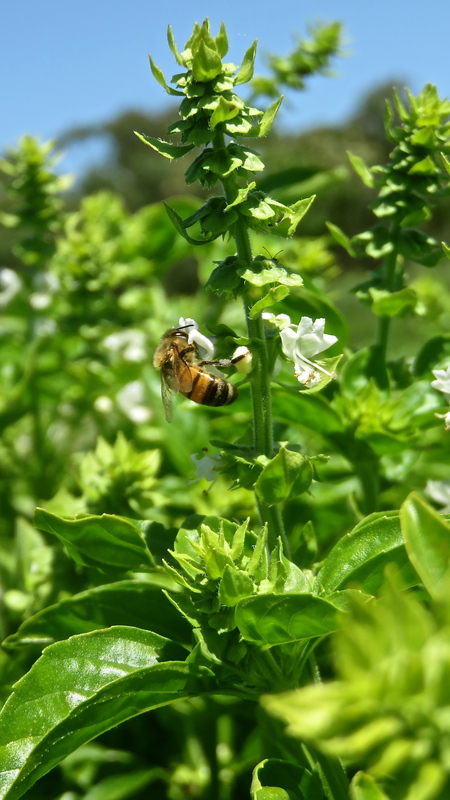 The golden sunshine, longer days, open windows and doors….and the sweet smell of basil growing in the sunshine. Fresh, green, vibrant. Soft, smooth leaves. Bunches of it on my kitchen bench to be turned into pesto…..now that is a taste sensation…home made pesto. It is so easy. So bursting full of flavour. 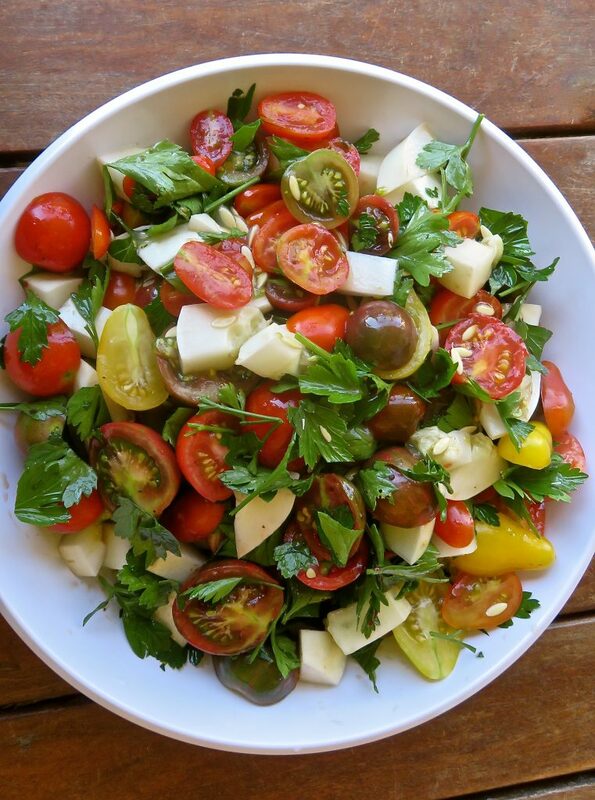 Toss it through your fresh salad (along with a few fresh basil leaves). Spread some on your potatoes at dinner time. Use it in bolognaise. Have it on fresh sough dough bread, toasted, with butter, sliced tomato and sea salt. I can feel my mouth watering. You can use it on pasta too. It adds a boost of flavour to so many things. Once you have enjoyed homemade pesto you will realise that the store bought stuff just isn’t the same. I have tried to find some that has that beautiful, intense, rich, full flavour and always find it is flat and bland by comparison. Homemade pesto is so delicious that the kids like to eat it fresh, on a spoon, when I make it up. And you just have to go back for one more little spoonful of that ‘fill your mouth with flavour’ experience. Sharp and strong at the start but leaving a rounded creamy note behind. Make up surplus and freeze in little paddy cake tins or ice cube trays and then place into zip lock bags in the freezer for easy future use. 60g Parmesan cheese – grated. Place basil, pine nuts and garlic in food processor. Process (scraping down sides occasionally) until almost smooth. With the motor running add oil in a slow stream. Process until oil is combined. Transfer pesto into bowl and add the parmesan. Stir until well combined. Now it comes alive. Add more parmesan if you prefer. Season with salt and pepper if desired. Stir. The pine nuts have a nicer flavour if roasted lightly in the oven first. If you are freezing it for later don’t add the parmesan until ready to use. 1/2 cup of lemon juice adds a nice zest and lift to pesto. You can use bunya pine nuts or even almond meal as a substitute. As the cold ice of Winter turned to cool Spring and then Spring to warm Summer, we have been waiting……waiting for the beautiful medley of cherry tomatoes that are “Jolly Good”. Reds, purples, yellow bells, stripy, fat and round, pear shaped or little ‘jelly bean’ shapes. 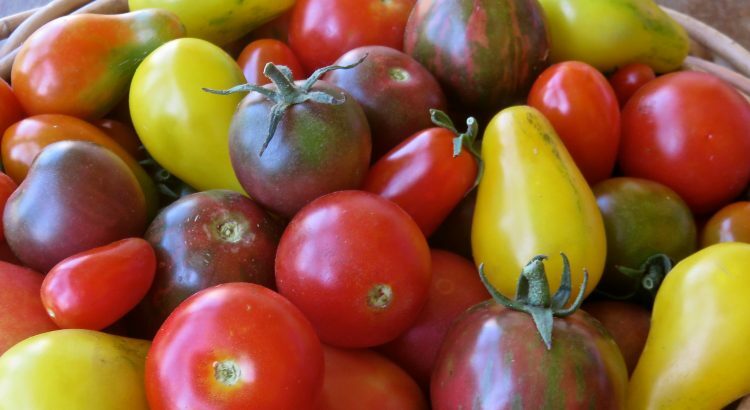 Old varieties of heirloom cherry toms with names like ‘Violet Jasper’, ‘Blue Berries’, ‘Red Fig’ and ‘Lemon Drop’…to name a few. We purchased the seeds from The Diggers Club. 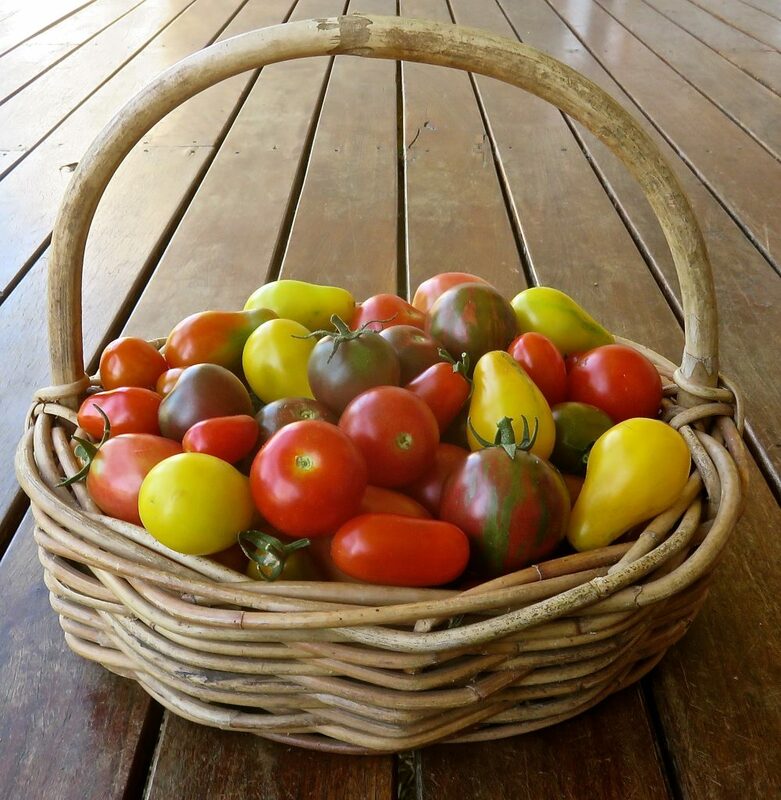 The day finally arrived….our 6 year old came shrieking excitedly into the house with smooth, bright, round balls of colour bundled up in her skirt, a huge smile on her face, announcing that we had tomatoes! My heart later smiled again as I watched 2 little girls scanning the row of green vines, and delightedly bringing back a brimming basket of assorted colours and shapes. Then they raced off in the sunshine to pick some white cucumbers and Flat Leaf parsley. 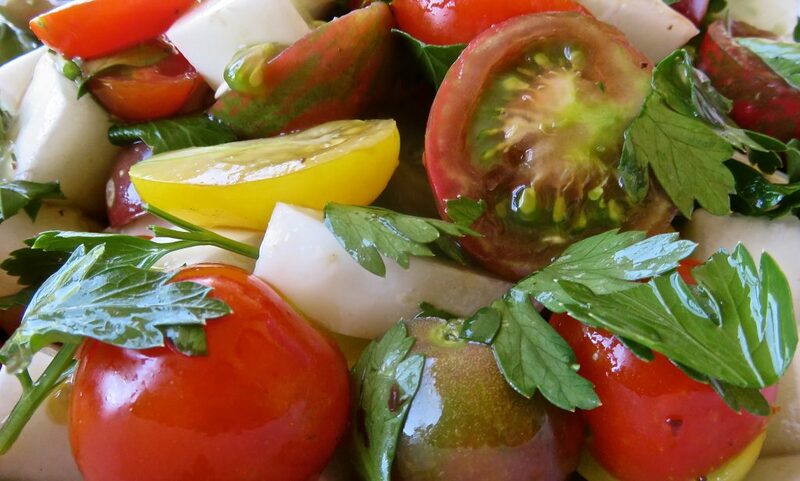 We sliced the juicy, little, sun kissed tomatoes in half, diced up the cucumber, loosely chopped up the fresh parsley, added some salad dressing and mixed it all together. What a feast for the eyes and the body. Full of vibrant colour and goodness….and the flavour was bursting out. picked it’. For children to feel they make a contribution and are valued is so important. They feel significant and secure. I remember being a child. It makes you feel warm inside. To embrace and participate in real life, and it is just GREAT! 🙂 From the squeals of delight and big smiles it is all very exciting. Only one childhood. We rejoiced together at our ‘first fruits’ for the season. And felt thankful – for each other and for this abundance. I see my son striding down from the paddock, heading towards the house, with a huge bunch of Flat Leaf Parsley and I groan…….out loud. I know what that means. Green smoothie coming up. And I mean “green smoothie”. But it’s a ‘sweet and sour moment’ because I smile to myself too. I appreciate it from deep inside my very cells. 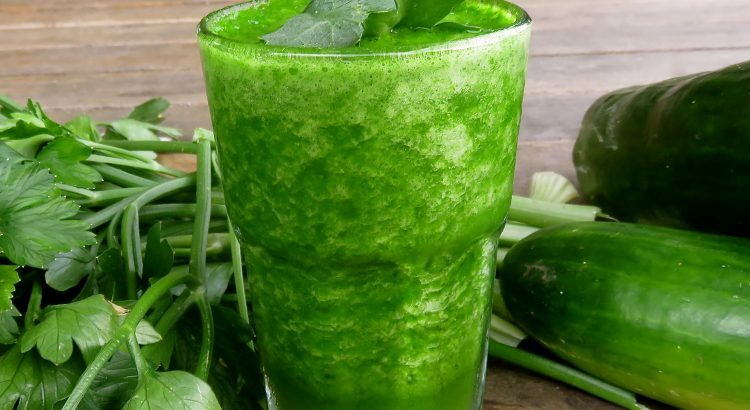 I really am glad to see him coming and though I groan again when he hands me the glass of dark green slime – oops – I mean juice, I thank him afterwards and tell him I’d be happy to drink the stuff every day. I really would. He makes it up for whoever is willing to drink it, including himself. He puts some water (we have rain water here) in our vitamix, a great bunch of fresh parsley which was vibrantly growing only minutes before, some ice cubes (this really does help – the coolness makes it more palatable), and whizzes it up til it is like juice. He adjusts the water to suit. We’ve had to almost eat it with a spoon at times- which isn’t the best. A drinkable consistency more like juice is the nicest way to have it. Last time he added just a hint of Stevia. A very small hint. It wasn’t too bad…..quite ok. Refreshing even. The Flat Leaf Parsley is sweeter than the normal Curly Parsley and a little easier on the palate. Though we’ve endured the Curly Parsley many times. You could actually juice it (versus using the blender) and add water to dilute it. Or just have a shot of it and get it down with one gulp. With blender you are getting the whole thing – fibre and all. Sometimes he adds kale ( or uses kale instead of parsley) or cucumbers, or just a few sprigs of dill for flavour. This truly is a ‘green drink’. But you could add some apple, celery, carrot or beetroot to taste. We mostly prefer the uncut version. So what is so good about Parsley? It truly is a tonic for your blood. I was recently reading an article about the health benefits of Parsley and it helped me feel glad all over again for that glass of green. May your cells rejoice too when they receive this nutrient dense, health promoting flood of goodness. The sensation that bursts through my mouth when I eat sauerkraut is always a pleasure. Sour but alive, hard to describe. Hints of whatever I have decided to add to the basic cabbage recipe. Even just plain old sauerkraut made only on cabbage and salt is a treat when fermented correctly. As it ferments it magically transforms from ‘salty cabbage’ (gross) to a zingy, sour, make your tastebuds really come alive kind of food. It transforms the humble cabbage into sauerkraut – full of Vit C, B Vitamins and living enzymes. And it is so versatile. Apart from eating it straight out of the bottle (no double dipping please!) and not being able to stop at the first mouthful it compliments so many foods. Whether it is eaten on homemade sough dough for breakfast, tossed through my shredded salad at lunch time or on my plate at dinner time with veggies and meat, sauerkraut always helps to lift a meal. It takes the flavour, the nutrient and the whole experience of eating to a new level. It helps my body to digest and absorb all those nutrients better and each spoonful of this delicious live food is teaming with probiotics – beneficial bacteria which help colonise the gut, boost the immune system and help our nutrient levels. Millions in every spoonful. No bland pills to swallow but a whole food that helps re-establish and revitalise my system. But by adding in kale or carrot, caraway seeds, and also prebiotics (foods that feeds probiotics) like garlic and onion, I feel really energised just thinking about the goodness created in that magic jar of living food. The sky’s the limit. I’ve added beetroot, apple, barley green, orange juice, matcha green tea powder, turmeric, and on and on. Some of them were a little overpowering. A bit strong – like when I added too much garlic or too much beetroot. Experiment ’til you find what suits you. I like 2 parts cabbage to one part Cavolo Nero or Curly green kale. Some grated onion, a few cloves of crushed fresh garlic, a little turmeric (but not too much) and a hint of match green tea powder for that extra boost of nutrient. The amazing thing about this wonder food is that it is SOOO easy to make. So simple that it is profound how good it truly is. I use 1 tablespoon of sea salt to 1 kg of cabbage. Just cut the core out of your cabbage, reserve a couple of the whole outer leaves for later and shred the rest of the cabbage very fine. Toss in the sea salt and massage it through with your hands so that cabbage starts to shrink as it releases it’s juices. You can add some caraway seeds for flavour – this is optional. As mentioned above, there are lots of things you can add. Try the basic sauerkraut first and then start experimenting. I give mine a bit of a pounding with the end of rolling pin to help the process along. HINT: Don’t do the pounding in the glass jar. I did this only once – the side of the jar exploded from the pressure and it made a huge mess with juice running down the sides of my bench and wasted a lot of time and good food! Pack the cabbage tightly into a wide mouthed glass jar or crock. Press it down as tight as you can. Leave a couple inches of headspace. I place a scrunched up cabbage leaf (reserved from the outer leaves of the cabbage) into the top of my jars. This keeps the cabbage submerged under it’s own liquid. It needs to stay submerged in liquid. The top of the actual cabbage leaf is often above the liquid but this is ok. So long as the sauerkraut underneath is submerged from the air it will be fine. I place a loose fitting lid on top so that it can breath. You can use a flip top jar with a rubber seal – this expands with the gasses. I also place my jars on a tray because during the first day or two the juices expand so that they sometimes overflow out of the top of the jar. After a day or so it settles back down but can make a smelly mess in the meantime if the jars aren’t on a tray. As it starts to ferment you will see little bubbles making their way up through the cabbage to the surface. Yay – it is coming to life! If for some reason not enough liquid comes out of the cabbage after a day or two or it evaporates along the way you can make a mixture using 1.5 tablespoons sea salt dissolved in 1 Litre of un-chlorinated/filtered water to top it up so that it stays submerged. Let it stand at room temp for a week or longer. We live in cool climate so when I make it at the beginning of winter I will leave it for a month or two or three. So long as it is submerged and not too warm it just gets better. When done, take the cabbage leaf off the top, toss it away, check that it all looks good and taste the goodness underneath. It should taste sour, not salty. It shouldn’t be slimy but sort of crispy soft. Don’t be fooled by the smell…it tastes nothing like it smells…always a pleasant surprise! Keep the sauerkraut in the fridge. It doesn’t need to be submerged in its own liquid once in the fridge but will keep for a long time…it never stays for very long in our fridge…..it disappears quite quickly. If you over salt it, it won’t ferment properly and will stay salty. I have found that I need different amounts of salt in Summer than Winter. 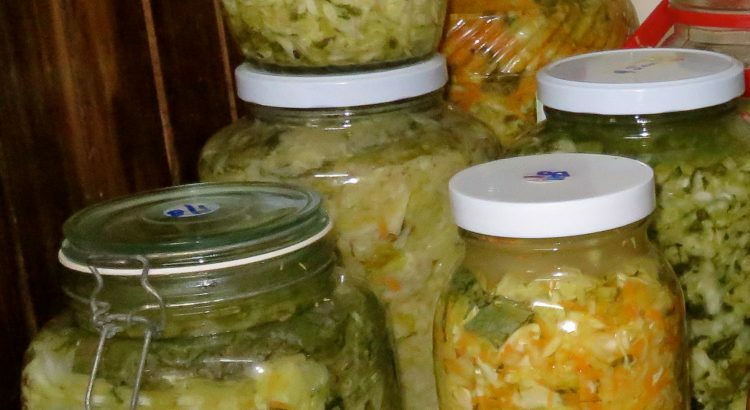 I have a ‘sauerkraut’ afternoon every few months and make up several very large jars at a time and empty them into smaller jars when I need them for the fridge. When the bottle of kraut has been eaten there is usually some of the fermented juice in the bottom of the bottle. This is a delicious super tonic. I resist drinking it myself and save it for the kids because not only do they love it – it is so healthy for their tummy’s. They love being handed ‘the dregs’ and slurping on this probiotic, nutrient dense, zingy juice. When someone in the household is feeling a bit off they will often reach for the sauerkraut jar and have a few spoonfuls to help settle their stomach. If you buy pre-made sauerkraut it needs to be unpasteurised. The pasteurising kills off the beneficial bacteria and while it may taste nice, you are missing out on the real benefit. Sort of like a beautiful rose with no scent….kind of feels like half a rose…if you know what I mean. The pasteurised stuff you buy in a can on the shelf in the supermarket is dead. As is the stuff imported from overseas. It was my first introduction to sauerkraut and I must say I wasn’t sold on it…it was sort of slimy, looked gross and didn’t taste that great. So if that was your first impression too then don’t give up….find the real deal. It should be in the refrigerated section of the supermarket/ health food store. My 2nd introduction was a bottle of ‘live’ sauerkraut. Very live! I placed it on the floor of the car and during the 2 hour car journey home it warmed up and I could hear it hissing and expanding as the lid bulged and it overflowed down the side of the jar and filled the car with a not too nice smell. A gassy cabbage smell. I took the lid off and tasted it and it was DELICIOUS. I was hooked. It didn’t last long. By that night the whole bottle was gone. Made by “Gutsy Ferments” in QLD. Some of the nicest store bought I have eaten. Now when I go on holidays I like to try sauerkraut from all around the country. It really is a unique product and has so many variations. A bit like kombucha…but that is another subject. So that is why I love sauerkraut. It adds zing , life and interest to my food and my body. And it is SOOOO easy. Why not go one step further and plant a ‘sauerkraut garden’. You wouldn’t need much space to grow a cabbage or two and a few kale plants or anything else you might like to add. It’s a great feeling to know that it all (or part of it) came from your own back yard. Our Babies stole the Show.